How does one break the execution of a long-running process in the python console of ArcMap? For example, how do you break a long iteration like the one below once it is started? I want to stop the process at any time I want by pressing a keyboard combination, clicking a button or something similar while the code I have input in the console window is running. Just tested it and ESC doesn't work either. ArcGIS just freezes for a moment and then continues. There doesn't seem to be a way to do force quit it once it runs in the ArcGIS Python console. You can't kill it using Task Manager either as the Python process doesn't show up there. If you really want to be able to force quit it, you might want to consider using an IDE like IDLE rather than doing it in the ArcGIS Python console. In IDLE for example, you can use Ctrl + Z or Ctrl + C to terminate the execution. When run kill_processx creates a small test file called stop_processx.txt. At the top or bottom of the loop in the main program check to see if the stop_processx.txt exists. If it does exist, execute any cleanup routines you need, then stop gracefully. How do I use sys.exit(0) in an arcpy script to exit early without having an error message show up? How to stop a command or prompt in Python? I'm working in 10.4, and I've found that I can click the close X while a script is running. 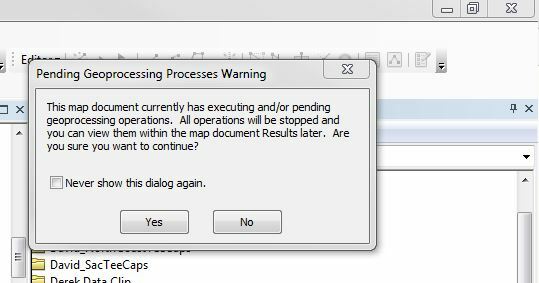 ArcMap will ask me if I want to cancel an operation. I click Yes. ArcMap then asks me if I want to Save before exiting. I click Cancel. The script throws a keyboard interrupt. At least in ArcMap 10.4, you can do this. Make sure the "Results" window is visible. (If not find it under "Geoprocessing"). Now if you have a command running it will show up in this window. Right click on it and press "cancel". What if under every line of code you add an if that checks if input()=="what ever you want in here" that uses sys.exit. Using IDLE, I have a file called "stop.py" which contains the single line: "pass". Keep this file open in IDLE while another .py script is running. Clicking F5 in the "stop.py" window resets IDLE. Not the answer you're looking for? Browse other questions tagged arcpy arcmap python-window or ask your own question. Stopping PyQGIS script that has infinite loop, using keyboard? How to disable and enable drawing in ArcMap using Python? Prompting for user input during ArcGIS Python script tool execution? Executing script in Python window of ArcMap? Printing to Python window of ArcMap using different font colors? Possible to execute external python script from ArcMap Python Window?